With so much to see and do in and around Holiday park, we’re sure you will enjoy your stay. Our sites can accommodate any type of camping equipment, from a pup tent to a 40' bus towing a car. We have over 200 acres, mostly wooded, along the picturesque headwaters of the Choptank River. Our complete camping rate schedule, including seasonal camping information, and online specials and discounts, appears below. If you would like information on groups, clubs, rallies, reunions, receptions or company picnics, please click here or on the link at the upper left of this page. add Thursday at 40% off, add Wednesday at 50% off! Applies to back-in sites only. FREE on-site storage with back-to-back camping weekends. No limits, all season. Rig to be unplugged during week. Selected sites only. Camp two nights for only $48.00 on our “Anniversary” Weekend, September 13-15. 40% off selected merchandise in our camp store. Check out supplies while they last! Rates are based upon two people (your dependent children 12 years and under are N/C) and include electric, water, CATV hookups, table and fire ring. Special rates on NASCAR Race Weekends & Halloween Weekends! Visitor fees are flexible. There may be an extra charge on special weekends. Visitors are required to stop at office to register and pay required visitor fee. A gate card will be issued for each vehicle ($10.00 cash deposit required), refundable only up to 10:00PM (office closing), at which time all visitors are required to exit the park. Visitors are not permitted to bring pets or alcohol on park property. 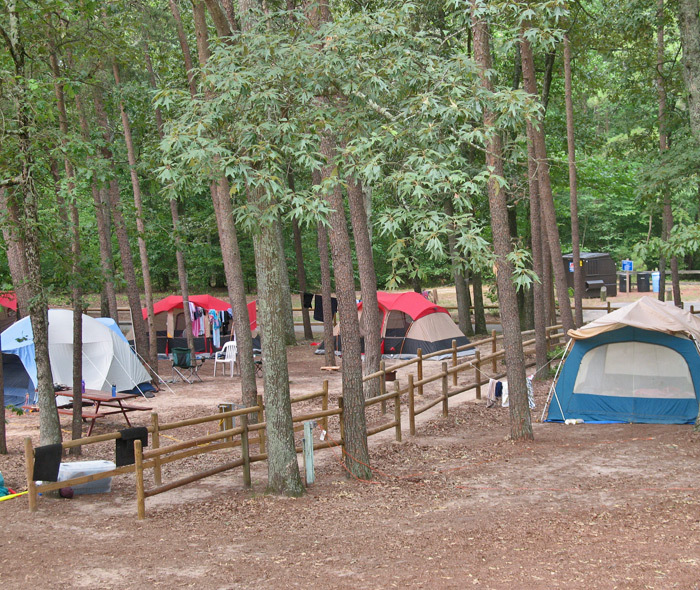 Management reserves the right to limit the number of visitors and/or vehicles per campsite. No visitors will be allowed entry after 9:00PM. Between 4:00PM and office closing. Arrivals prior to 4:00PM subject to $2.00 per hour charge. By 3:00PM. Late departure is charged at $3.00 per hour. We cannot hold any site without a deposit. $5.00 cash deposit, refundable upon departure. One pass per vehicle. 10% discount on daily rates to valid card holders - Good Sam, AAA, military, senior citizen & others. Refunds with 7 or more days notice, less $15.00 service charge or camping credit, less $5.00 service charge. (Credit is good for one year from date of issue.) Less than 7 days notice, no refund or credit. No refunds/credit for cancellations on Memorial Day, July 4th, Labor Day, Anniversary, Halloweens, or the two Dover Downs Race Weekends. May not be combined with other discounts. Specials subject to change. Available with back-to-back camping weekends, no limit, all season long. Rig is to be unplugged during week. Selected sites only. Camp a 7-day week for only $285.00 or $300.00 (with sewer). Camp a 9-day week for only $380.00 or $410.00 (with sewer). Longer-Term Stays: Dealt with on an individual basis. Store your rig in our storage lot. (All stored rigs must be 15 years or newer, be kept currently tagged and comprehensively insured.) With just a phone call from you, we can make a reservation and arrange to move your rig to a site so it’s ready for you when you arrive. We can also move the rig back to storage. Whether you enjoy Holiday Park’s fine recreational facilities, participating in our many varied activities or sightseeing & shopping in nearby towns, having a seasonal site with us afford you lots of opportunities to do some of each. We’ve designed a Seasonal Package for you (April 1st - November 1st). Use the chart below to determine the rates that are right for your needs. We offer 6 categories to fit every budget. The categories are based on site sizes, amount of shade, how level or secluded and other factors. Rates are based on 2 adults. Your dependent children 5 & under are free. Electric is metered. Children 6-18 years: $60.00 each. Over 18 years: Regular guest fees. 4% Discount for paying in full by the season start date will save you between $93.00 and $132.00, depending on site choice. No discounts with a credit card. Seasonal’s Discount Coupon Book is included with every season package. It includes visitor passes, free pump-outs (other than the regular runs), game rentals, movie rentals and moving rig on or off site. Camping Usage for the period between April 1st and November 1st is based on weekend usage plus 2 weeks vacation time, or 81 days of camping (additional days can be purchased). For those of you wishing to camp more nights, for whatever reasons, please make arrangements with management for a customized plan to fit your camping needs or wants. 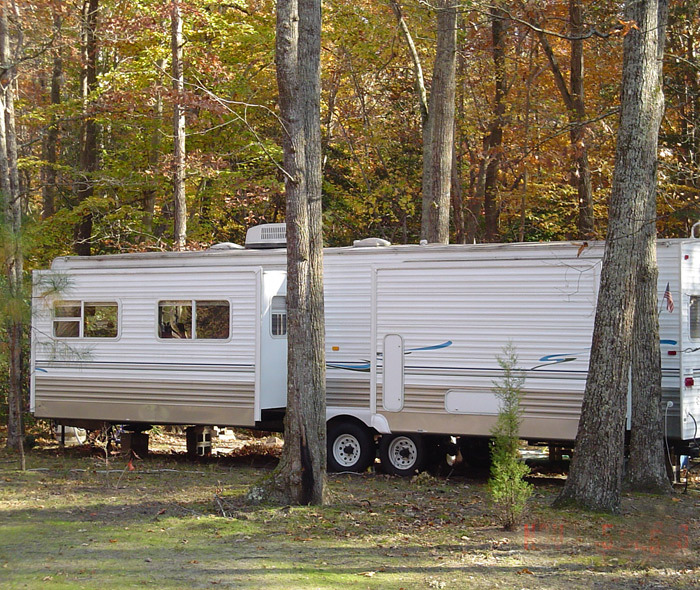 Free RV Storage during off-season is offered to those going seasonal again the following year and paying the specified deposit by October 1st. If the decision is made to not go seasonal, storage of rig will be due from the date the rig was put into storage. Free Winter Storage of Deck(s) is offered. Sections should not exceed 4' x 8' (5 sections maximum). Winterizing of RV’s is available for those signed up and paid by November 1st. Deposits Waived for Sports Equipment Rentals (tennis, shuffleboard, volleyball, basketball, billiards, horseshoes, etc.) with usage fee discounts before Memorial Day weekend and after Labor Day weekend. Free Pump-Out Service (with prior sign-up in office by Sunday evening). One per week. Approved chemicals must be used. Patio Lights. You may have up to 200 watts total with one bulb up to 40 watts and all others at 20 watts or less. Outdoor lights to be turned off before retiring at night. Bug lights up to 11:00 PM only. Pets Allowed (subject to restrictions in our rules.) Click here for more information. Seasonals’ Christmas Party. First Saturday in December. Lots of good food, fellowship, games and gift exchange. Visitors Welcome - subject to our visitor policies and rules. No charge to Day Visiting parents. Movie Library offering a large selection of movies (VHS and some DVD - G, PG & PG13 ratings only), at low cost rental rates. Three Fully Equipped Playgrounds and one toddler lot. Full Season Schedule of planned weekend family activities. We maintain a beautiful, natural setting free of items that are not indicative of camping. To keep this setting, we DOT NOT PERMIT outdoor refrigerators, indoor furniture outside, sheds, non camping-related accessories, golf carts, battery operated children’s vehicles, ATV’s (All Terrain Vehicles), trenching or digging (i.e., electric cords or blue tanks) and stacking of firewood between trees. 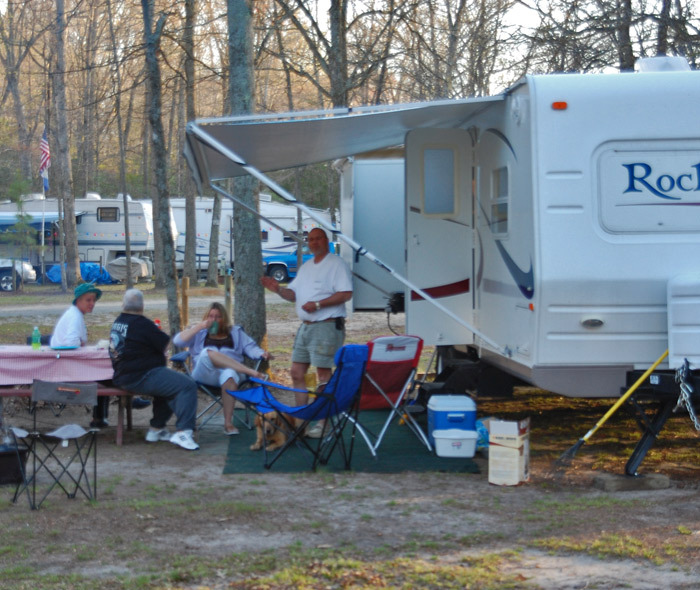 Vehicles of campers and/or their guests must be parked within the assigned campsite or in the extra parking lots. DO NOT use open campsites or spaces for parking. All rigs for camping or storage must be 15 years old or less. All rigs must have approved and working holding tanks, valves and RV plumbing fixtures (no household fixtures). They must be clean and neat in appearance so as not to detract from the aesthetics of the park and your neighbors. Each year we must have a current copy of proof of comprehensive / full insurance coverage, and the trailer / motorhome must have current tags mounted on rig. Recycling programs are offered so we can all help “Mother Earth.” Your efforts in separating aluminum, glass and plastic from your regular garbage and putting them in separate bags for collection is appreciated. The dumpsters provided are for garbage generated on the campground and must not be used for any other purpose. Do not discard items such as old carpeting, appliances, boxes, etc. in the dumpsters. Site sign up for the following season begins on September 1st and the deposit amount of $100.00 must be paid at the time of sign up. Current seasonals wishing to change sites the following season may do so. 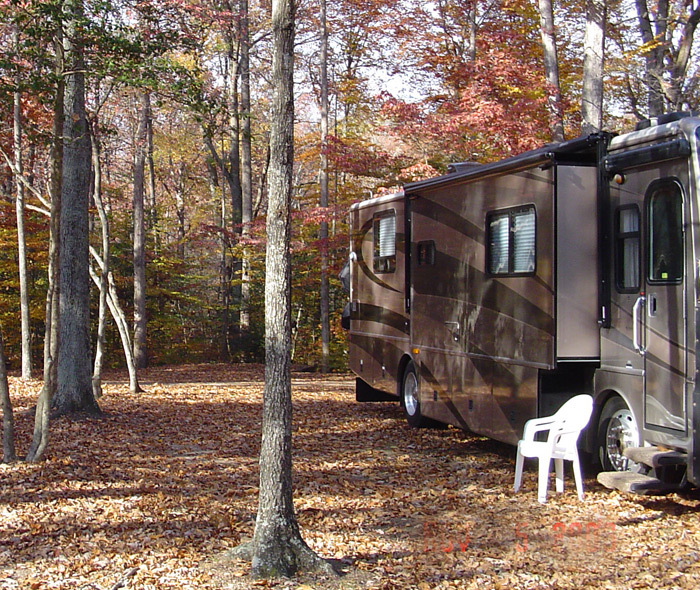 Seasonal campers currently occupying a site have the option to keep the same site the following season, providing all bills are current and their deposit in the amount of $100 is paid by October 1st of the current season. A minimum payment of $600.00 ($100.00 initial deposit + additional $500.00) must be made paid by November 1st of the current year. The monies received will be applied to the seasonal site balance. If the payments are not made on a timely basis, you risk losing your site selected and all monies that have been paid to that date. Sites not covered with the required deposit will be released to the first party requesting the site and paying the required deposit as described above. A minimum of 72 hours must be given before moving a rig on or off site. Payment Policy. Campers may make payments in five (5) installments. The balance due at start of season will be divided as follows: 25% due April 1st; 20% May 1st, June 1st, July 1st; and the remaining 15% due August 1st. Seasonal site payments not made by the specified due date will have a $10.00 per week penalty imposed. Sorry, there are no refunds on seasonal site deposits or payments. Billing & Payments. Electric meters are read the first of each month. Due to Choptank Electric billing dates, your first electric bill we not be due until six to eight weeks after your “start date” and at intervals of approximately four weeks thereafter. The amount of your last bill will not be known until after the season ends. Store tabs will be totaled on a monthly basis and are due the first of the month. Bills will not be mailed. Please check with the office monthly by the due date for settlement. Bills not paid by the 10th of the month will have a ten percent (10%) surcharge added to the unpaid balance. It is your responsibility to check with the office on a timely manner in order to keep up with your electic bills and store tabs. An outstanding balance of $25.00 or more, that is in excess of 30 days past due, will result in gate passes voided from the system, or a lock will be installed on your rig, until the balance is brought current. We require an End Of Season deposit of $100.00 to cover any outstanding bills and store tabs after the camping season. A complete listing of any and all charges will be mailed to you as soon as possible, along with a refund check for any balance due you (or a bill for any balance you might still owe). Gate Cards. A gate card will be issued to each driver covered under the seasonal contract and is to be used by that person and their vehicle only. A deposit of $5.00 will be charged for each gate card, refunded in full with the return of the card at the end of the season (November 1st), provided the card is in acceptable condition. Cards that are outstanding after the end date will be voided with no refunds.